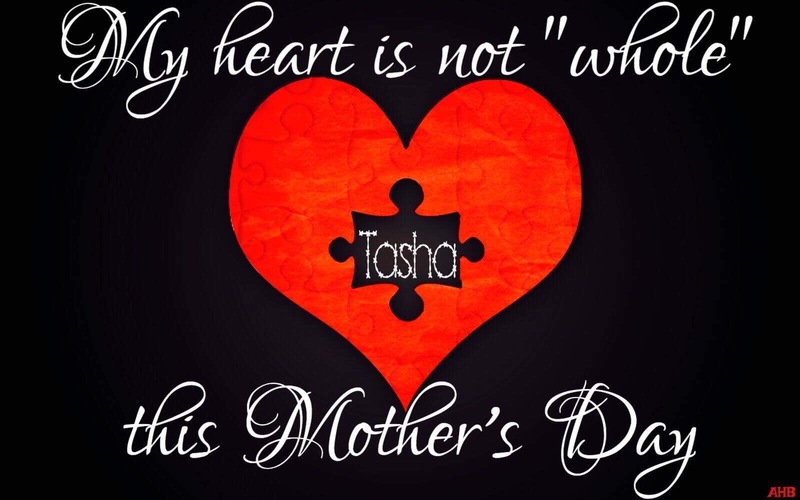 In a few hours, it will again be Mother’s Day – the holiday I struggle with the most. I cannot believe it will be my second Mother’s Day without you. How do I still call myself a mother when you are not here to call me Mommy? I wish I had some kind of answers – but, here we are, sixteen months later, and I still don’t know what to do – where to turn – what to do with my life without you. It feels wrong to even get out of bed on the day. Others offer to visit – bring cards – someone even wanted to bring flowers by – I push them all away. It feels like I am being disloyal to you, if I accept these offers. You were always so jealous of the attention I gave to others – I wonder if you feel differently now. How many pot roast dinners did we share on Mother’s Day? After working at Bennigan’s, I never liked to go out and eat on Mother’s Day – the busiest restaurant day of the year. I didn’t even care that most of those days I ended up cooking part, most or all of my dinner. I just wanted to be with you – and, honestly, that’s all I want now. I just want to spend time with you. I think of all the missed opportunities – the times when I could have been with you – I missed out and now I live with the regret. More than anything, I would love to be able just to know you are at peace – to know that you are okay with me here, instead of with you – to know that you want me to go on – to know that you love me – and that you forgive me my shortcomings as your mother. I imagine that if I could figure all this out, I could sleep without nightmares – sleep all night – and, make it through my days with a little more confidence – a little more vigor. I love you, Tash. When I was young, I didn’t have a lot of goals or a lot of faith in my ability to escape the lifestyle of my family. Oh, I wanted so much more – but, I had no idea how to get it. Then, you came along. For the first time, I had more than “wants,” I had dreams – goals – and, I would have moved heaven and earth to achieve them. I wanted you to have everything I didn’t have – especially the knowledge that you had a mother who loved you more than anything in the world. I think I did that – I hope I did that. I do know that I gave you a better life because you made me a better person – you made me work hard – dream big – to give you the life you deserved. So, here we are – you there without me – me here without you. You were my best friend – my memory-keeper – we were supposed to grow old together. After all, we were only separated by fifteen years. You promised to push my wheelchair. I am missing so much without you here. There is no compromise, though – no easy fix. I hope you are faring better without me than I am without you. I hope that as time goes on, I figure out what purpose there is to my life here without you – that these days become easier – that I am able to fill these “special” days with the happy memories we shared.